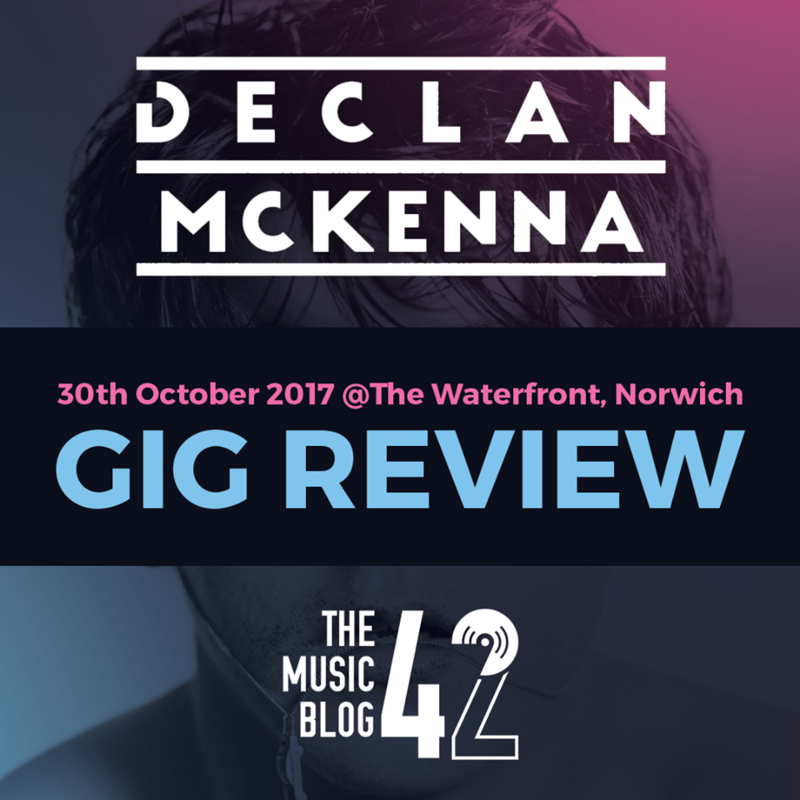 One of the brightest upcoming talents, Declan McKenna, entertained a sell-out crowd at The Waterfront, Norwich tonight (30th October). McKenna opened his triumphant indie-pop set with arguably the best song from his debut record What Do You Think About The Car?, The Kids Don’t Wanna Come Home and from the moment he sung the first line he had the crowd in the palm of his hand, with everyone jumping up and down and their phones annoyingly stuck up in the air. The 18 year old frontman has had quite a year with the release of his debut record and two sell-out tours, and tonight showed why he is so highly thought of in the indie world with his mature lyrics but fun instrumentals. Inbetween songs like the guitar-driven Make Me Your Queen, which he stopped mid-way through to make sure “that everyone was ok and having a great time”, and the slow burner Bethlehem were the slightly amusing skits of McKenna rambling on about his love for “Heinz Baked Beans with Chilli Flavouring”. Let’s not forgot he was actually wearing a Heinz Baked Beans t-shirt throughout the show. What I personally love about McKenna is his mature approach to writing songs, each song has a different meaning to it, with the crooning Mind about himself drunk after a show, and the absolutely incredible Humongous about his thoughts on society and the milennial generation. The track Isombard got the crowd going for the last half of the set, with a rather large moshpit forming for the drop on the chorus, and you could say ‘it went off’, but it’s probably the worst thing I’ve ever seen at a gig. Never-the-less, Declan was still on fine form. His new single Why Did You Feel So Down sounded even better live with the full band, the track has a tropical feel to it and that really shone through on this one. His last two songs of his set are argubly his most-loved tracks, the hearty Paracetamol, written about trans-bullying and his reactions to a story he read about it, showed how much the crowd adored McKenna with the whole room chanting the lyrics back to him, whilst he walked along the crowd barrier admiring his audience. But the song everyone was here for was the massive Brazil, the song that got him to where he is today, written about the FIFA corruption scandal. It’s a brilliant track on the record, but live, it’s a different beast. What is usually a jingly guitar number turned into a europhic rock belter culminating in an epic crowd surf. The encore song was the last song from his debut Listen To Your Friends. Again, a usually acoustic track turned into an up tempo singalong. The perfect end to a great set. Tonight, Declan McKenna proved he is one of the best live acts around at the moment. An incredible set, his awkward but cheeky stage prescene and anthemic tracks makes one of his gigs a must-see. One of my favourite gigs of the year, this kid is going far.